As I am preparing the materials for my next workshop, I came across a video about homeless people. As a street photographer, I regularly encounter people who are homeless. Homelessness is a complex and emotionally difficult issue to photograph well. I don’t think that it can be done well as a snapshot. 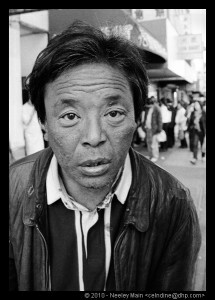 I teach my workshop participants to never grab a photograph a homeless person. All that photograph will tell us that there is a homeless person in that spot. When photographing people who are in such difficult circumstances, a single snapshot does nothing to tell their story and it is in some ways exploitative. As a photographer, I want to show more about a person than just their face and body. I want my images to have emotional and educational impact and for the viewer to make a connection to the person in the photo. When we look at photographs of homeless people, the first thing we see is “homelessness” and nothing else. It’s hard to get past that one fact. Sure, we feel sympathy, but I would rather feel empathy; to share the pain in some way. To do that, we need to connect with that person. So, I advise the participants, that if they are going to photograph a homeless person, that they should talk to their subject. Share something with them, even if it is just some time. Introduce yourself, ask them their name, and then ask if you can photograph them. This experience will not only connect two human beings, but that connection will come through in the photograph. The viewers will gain see and gain a deeper connection with person who is homeless. As viewers, we may not know their name or their story, but we will know that they are more than just a homeless person. They are a person who happens to be homeless.